Welcome to the RIMTA.net website. LOGIN in the top right corner by clicking on the silhouette. ATMNE Journal This is a members-only journal but if you are a member of RIMTA, you are a member of ATMNE!!! You must have the access code which was emailed to members. Contact gkilday@gmail.com to get the code, if you are a member and misplaced the email. ATMNE has a new digital presence. Visit ATMNE at their new website or on Facebook or follow ATMNE on Twitter @ATMNEmath! 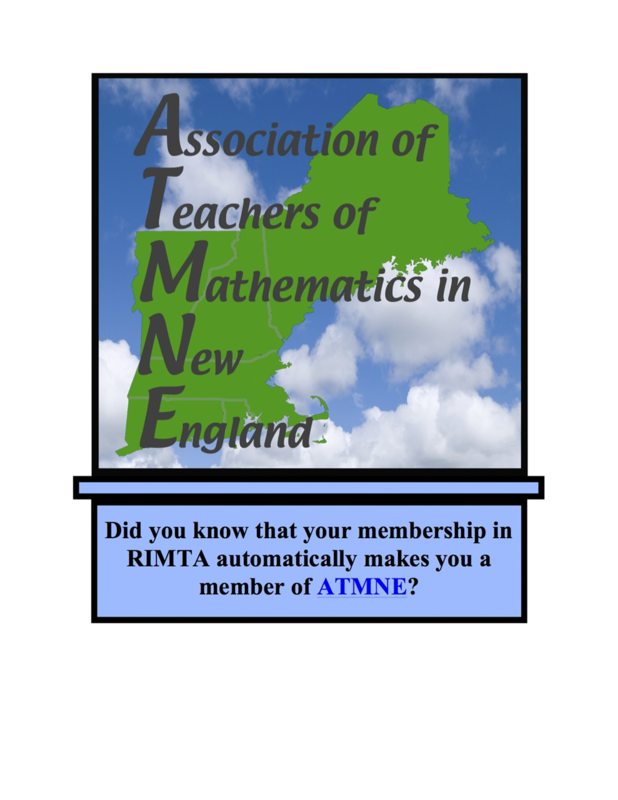 When you join RIMTA, you automatically become a member of the Association of Teachers of Mathematics in New England (ATMNE). ATMNE members receive two annual newsletters, the New England Mathematics Journal (NEMJ), invitations to regional conferences and more. All ATMNE publications have gone GREEN so make sure you keep your e-mail up to date.